The Conversica Assistant is expert at identifying hot leads who are ready to engage with you. The Conversica + Chili Piper integration allows reps to present leads with an option to schedule a meeting at a date and time convenient for all parties involved, reducing friction and increasing sales opportunities. When the Conversica Assistant uses a Chili Piper-enabled conversation, the Assistant's messages can contain a URL that links to your Chili Piper router. In this link, Conversica will pass the Salesforce ID of the lead to Chili Piper so that all lead activity can be tracked. 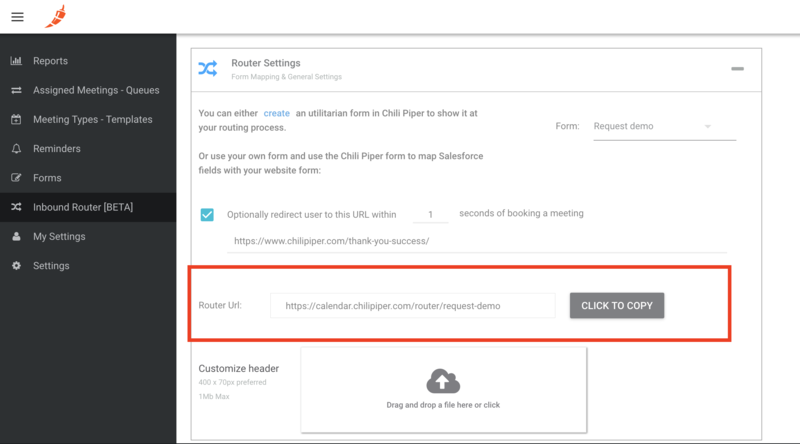 When a lead clicks on the Chili Piper link, they will be given an opportunity to select a date and time for a meeting. Once the meeting is booked, the Conversica Assistant will stop further messaging and skip to the standard lead follow up process with the lead. Follow the instructions from Chili Piper to configure an inbound router. Within Chili Piper, copy the router URL form the Router Settings section of the router setup page, as shown below. Provide the router URL to your Conversica account manager, who will configure a conversation with the proper settings for your router. Below is where you will find the Router URL. Please note that some accounts may not have access to Chili Piper conversations depending on account type. Contact your account manager for specific details. Set the workflow rule on the Lead and Contact objects with the evaluation criteria "created, and any time it's edited to subsequently meet criteria." Run the rule if the following criteria are met: "Lead (or Contact): Appointment booked NOT EQUAL TO null." Set the workflow to update the field "Lead (or Contact): Conversica Options" to the specific value "Skip to follow-up."